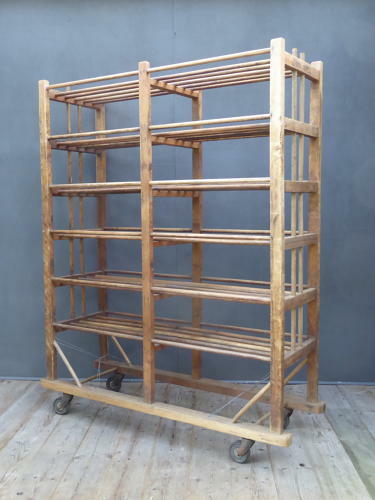 A stunning example of a large antique shoe factory rack. A beautiful piece of industrial design, the timber carcass raised on large cast iron castors & supporting six dowled shelves, all with a wonderful age related patina. The lower section is supported by wire stretchers on both ends & the upper ends retain traces of their original stencilled labelling. The trolley would have been used to transport quantities of freshly made shoes within the factory & now makes a charming & functional piece of furniture. Wear commensurate with age, good solid condition overall showing numerous pleasing signs of its industrial past. Unrestored. Collection in person or by courier due to size, we do have a couple of reasonably priced couriers on board so please do feel free to enquire about shipping.